The most important thing Marco provided was their expertise in the wireless arena. We felt they were looking out for our best interests while keeping our budget in mind. On Sunday, December 8, 2013, we drove up to our truck yard and saw that our truck shop was engulfed in flames. It was devastating. Fortunately, we had Marco’s Axcient backup server. By 8:30 that night, (Marco) had temporary computers up and running and had downloaded all of our data that had been saved on our Axcient backup system. Marco has the highest quality service. They take care of us. Technology is not something we want to worry about - we want someone to worry about it for us. Marco's Managed Services Program has been one of the top three best business decisions I've made over my 30-year career in management. I would recommend it to anyone. Marco has the VoIP expertise to meet and exceed expectations. This is one of the biggest technology projects we’ve had in the last five or six years, and it was the smoothest implementation we’ve had. That says a lot about their capabilities. Marco helps us understand the short-term and long-term cost in relation to the benefits received so we are able to make informed decisions. Mike (from Marco) is highly competent in this role and has brought tremendous knowledge and skill to our IT department. We save $350,000-$400,000 a year with the assistance of Marco operating our printing systems. Marco is head and shoulders above most, if not all, of my vendors. I like being able to have an honest conversation with Jason and Mike (from Marco). That happens because they understand our business and I feel good that we are not going to be sold something we don’t need. It’s a constant relationship. Zach McBride (Account Manager) keeps following up with us to make sure everything is going smoothly – he is personable, knowledgeable and very responsive. We are extremely pleased with our decision to take our business to Marco! Marco’s philanthropic efforts have enabled us to provide services to patients and families that are often times not covered by insurance. Annually they contribute to our major fundraising events through not only monetary gifts, but also their expertise in technology. This helps us communicate stories about the impact that philanthropy is having on patients and families. Through their tremendous generosity, Marco has empowered CentraCare Health Foundation to improve the health and healthcare for thousands of patients and families in Central Minnesota! We are honored that Marco will be the presenting sponsor of the Holly Ball for the seventh consecutive year. I can't say enough about how grateful we are for Marco's commitment and dedication to Holly Ball. Marco's support truly helps our hospice and cancer patients and their families' each and every day. Above and beyond giving financial support, Marco staff has helped develop an amazing technology system for our event that is high-definition, high-performance and brings our event to a whole new level. We could not have done it without the support from Marco and their employees in our community. When I think of Marco, I think of their spectacular service. Not only does Marco turn technology challenges into profitable and cost-saving solutions, but they provide the kind of service that touches the hearts of communities. I have grown to know Marco as a compassionate and responsible partner willing to step up when the community stands in need. For several years now, Marco has graciously sponsored the Quiet Oaks Hospice House annual fundraiser, Autumn Reflections, and has gifted the time and talents of employee Patty Tholen to assist on the planning committee and Quiet Oaks' general marketing committee. Marco is an organization that empowers innovation, confidence and sustainability for the greater good. Marco is an invaluable partner with CentraCare Health and numerous other organizations in our community. Marco's annual sponsorship of CentraCare's signature event, Holly Ball, allows CentraCare to provide services to our hospice and cancer patients and their families that would simply not be available without their support. This shows their commitment to making our community a better place to live and work. Marco's leadership and employees are our neighbors and friends. We are fortunate to have Marco in our community! Marco empowers employees to grow their career, personal life and technology talents. Not often can you find a company that allows work-life balance. Marco is powered to grow! People and performance with a foundation of customer satisfaction allow our technology solutions to empower our clients to enhance their business initiatives. I’m empowered by the amount of responsibility I am entrusted with at Marco. I thrive on being challenged and learning new concepts, and my manager understands that and challenges me to rise to the occasion with a sales territory that has a varying complexity. Marco has also allowed me to work on my personal goals through its healthy work-life balance. Marco unearths the desire to be great in all aspects of my life by always being surrounded by amazing people, wholesome ethics and a positive environment. Marco tech support has helped our company several times and I've never had a negative experience, which is saying a lot! Thank you! As a young individual, you might feel intimidated in a new job with little experience – but not at Marco. I feel privileged that Marco has such a collaborative network of employees that offer me support and respect as I begin my career. It’s rare to find this level of engagement in a company as large as Marco. The flexibility and work-life balance Marco offers its employees is unmatched and I think it clearly rubs off on the personalities of the people that work here. Everyone is constantly smiling and saying a friendly hello to one another which makes it hard to be in anything other than a good mood coming to work each day! The Marco culture empowers me – as does our phrase, “work hard – play hard.” I’m fortunate to have had great mentors over the years who have helped empower me into the professional I am today. I feel empowered by my freedom to work independently, as a team, or with a specialist in order to get the job done. I love the flexibility to decide which way is better than the other – depending on the circumstance. Personally, I can’t say enough about Marco’s great work-life balance. I will be forever grateful for the generosity my co-workers demonstrated last summer when my niece was battling cancer and we had a fundraiser on her behalf. Also, we welcomed our first child into our family last October and Marco was generous with allowing me to spend time with my family.I wear the Marco logo proud! In 2008 after a recent heart transplant, Marco hired me as a sales manager for the Fargo area. They empowered me to develop a sales team and build a recent acquisition. I took this as a chance not many companies would have done. In 2012, another acquisition came up in Bismarck, ND and I was transferred there - so I could be closer to my children. Then again in 2013, health issues started and my transplanted heart started to fail. Marco stood by me during the rehabilitation period and welcomed me back as soon as I was able to work again. In the last seven years I have said this many times - I owe Marco a huge thank you for why I am still alive. m:powered is just a small campaign to many, but to me, it is real life. Thank you Marco and the many friends I have here. This is real m:powered. Marco has been an excellent organization to be apart of, both from a professional and personal perspective. Marco's leaders care about the success of our company, as well as the success of their employees. I look forward to many more years! Marco's approach to how it does business makes me proud to be an employee. And that fact alone m:powers me as an individual to live up to the professional standard set by Marco and its leadership. Marco's focus on helping the community really sets them apart and they continue to support and encourage me to do the same. Before coming to Marco, I was a retail manager. I took the dive into repairing copiers, and I will never look back. Not only do I have great coworkers in the office here, but I have a great support of all the other copier techs that are just an e-mail away. This is the overall best team atmosphere I have ever had the chance to work in. I look forward to the many years to come. Marco has empowered me to challenge myself in my career and my goals. I have learned that working at Marco gives me the opportunity I was looking for to excel in my career and to work for a company that has the culture that only one can hope for. The possibilities of growth in my personal goals, and the opportunities that I have yet to encounter, are what empower me at Marco. Marco has empowered me with the opportunity of an internship while I was still in college. The team at Marco was fun, flexible and were always there to help me learn and grow with a real life, hands-on internship. I am thankful for Marco because they have empowered my mental, physical and emotional stability of what it is like to not only work for an amazing company, but for a place that you can call home. I have been here for a short time, but wow it is an amazing work environment. People really seem to enjoy being here. In every aspect of my job I feel totally supported and encouraged not only to do my job, but to grow and expand my current skill set. The word "Team" really means something here at Marco. I really enjoy coming to work everyday. I sincerely feel m:powered everyday to face the day and excited about each daily challenge. Knowledge is power and I learn something new nearly every day here at Marco. Marco's culture has m:powered me to take control of my position and responsibilities and feel like a veteran in my field right from the start. I came in as an experienced tech but there always seems to be a challenge fitting in to a new system when coming on board at a new company. Not with Marco! The culture here clearly gives managers and employees the freedom to operate as a team that is always open to new players. The network of support built into the Marco system helped me get up to speed in a very short time. I am now in my 15th year with Marco and never could I have dreamed of working for an organization with a culture that truly thrives on customer service, professionalism and balance. It has empowered me to have a successful career , while balancing time with my family. Loving what you do is a big piece in personal happiness and satisfaction. Thank you for letting me be a part of it. Marco's wonderful culture has empowered me to balance my work life, as well as a busy home life. I feel fortunate to work for such a wonderful company that puts so much value on happy employees and understands how that translates to satisfied customers. Since my earliest involvement with Marco, I knew this was where I wanted to build my career. I have found Marco to be world class in many ways, especially the manner in which they support their employees, customers and communities. Marco has empowered me to make the most out of everyday, and I look forward to many great years ahead living up to the great opportunity they have provided me. I always thought Marco was an intriguing company prior to my employment. However, I knew Marco was a truly empowering company when I first met Steve Gau and he explained how he wanted to take on a new adventure by starting a Business Development Team. This was also a new adventure for me as well. I wanted to make sure Steve's idea was executed properly so the team would have the same success and longevity as the other departments within Marco. I told one of my longtime colleagues, Terry Willis, about the team we were building. As much as I wanted to take the lead of the Business Development team, I knew that with Terry on board, we could be the 96' Chicago Bulls of Business Development for Marco. Three years ago we started this team and today we are going stronger than ever! I am empowered to do my best each and every day. Having hundreds of co-workers to rely on when needed makes it easy to ensure customers are always receiving the best customer experience. The work-life balance Marco provides has given me the needed flexibility with my 2 year son. Our team here at Marco empowers me to find ways to grow everyday. 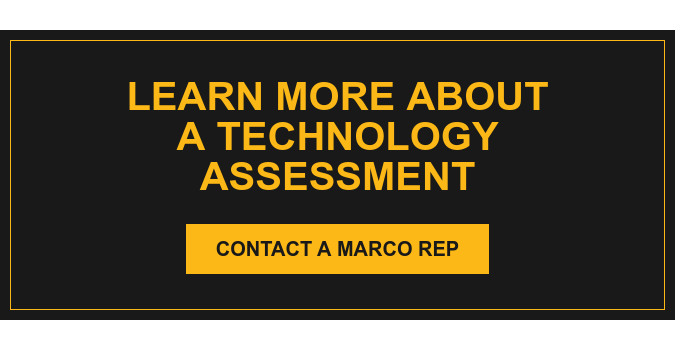 Whether we're tackling a new technology or looking to improve the next business process, the culture at Marco is absolutely one of growth. Marco has provided me exceptional opportunities for professional growth through our employee training programs. They've provided technical growth through our many partnerships with our manufacturers. Informally, the leadership team and my peers consistently practice a culture where sharing knowledge and experience are encouraged. Its great being in an organization where we are all driven to grow, embrace new technology, seek out new challenges and motivate each other to make Marco the very best it can be. I've been with Marco for less than two years, but I feel that my time here has bettered me in so many ways. I love that Marco seriously considers where someone will fit best within the team; my job is an absolute perfect fit. Not only does it highlight my strengths, but it also provides me opportunities to be mentored and molded to better handle what some might see as "weaknesses." I understand myself, my values and my communication style better since joining Marco and all areas of my life have benefited; work, family and my continuing education at St. Cloud State University. I am honored and proud to be part of the Marco family. The Marco culture empowers me to be the best and do the best I can every day. Marco's focus on supporting community really sets us apart and m:powers me to do the same. As Brand Manager, I volunteer in a variety of ways. I give my time to several organizations by being a member of marketing and creative committees, a Junior Achievement volunteer and by attending many outside events on behalf of Marco. I am grateful for the time Marco allows me to be out of the office and is truly a reflection of the work-life balance Marco believes in. I am blessed and fortunate to be working for a company that values employee satisfaction, which translates to customer satisfaction. The culture of Marco empowers me. At Marco my voice is heard and my opinions and ideas matter. Past employers would talk about 'open door' policies, but it was never safe to do so. At Marco, if you feel the need to talk with the CEO, or any other 'C' level person, you can, and they will welcome you and thank you for your input. That's empowering. My m:powering story is that I feel great waking up every week and feel good about coming into work. That's when you know you have a great career in your hands. It’s a wonderful feeling coming into work every morning and no matter who you pass by, you always hear ‘Good Morning’. I come to work with a smile and leave with that same smile. A company that never gives up on their employees and customers is the best place to work at, and I feel Marco is that way. Its great knowing that Marco understands family, friends and my needs when a rough or happy time does occur. Marco is growing, and with that there are more opportunities for me to expand my knowledge. I feel Marco wants their employees to go out there and move to the next level, as I have. Working at Marco, I know walking in the door everyday that I can make a difference. Teamwork is something you can count on faithfully. Marco = m:power. After 18 years, I take it for granted sometimes how great it is to work for a company like Marco. There is a top to bottom culture of believing in treating our customers and the employees with respect and actions that lead to their success. Marco is a place where you can not only find a job, but more likely find a career. I couldn't be more proud to work for a company that has helped me be successful both in my career and personally! Marco m:powers me to grow in my skills and take on new responsibilities within Marco, while still making sure we have a great work/life balance and give back to our communities. I am so proud to work for a company that encourages hard work and excellence, as well as giving back. In the short time I have been with Marco, they have empowered me to become an industry professional. They have taken an interest in my growth and goals within the managed services profession, and have provided me with the tools in which to succeed. I was given an opportunity to be an owner at Marco roughly 4 1/2 years ago. This offer came at a point in my professional career where it was time to make a change. As I came aboard, I found the attitude towards employee owners and customers refreshing. I am able to use my past experience as a consultant, technologist and teacher to extend Marco's culture to the owners and customers I come in contact with everyday. Marco has given me the opportunity to grow professionally while maintaining a great work-life balance, which is very important to me. I feel that I am poised for a successful and fun career here at Marco. Life is too short, so make sure you are doing something that makes you happy, whether at home or work. I love working at Marco! The work-life balance and flexibility is awesome, and very hard to find with most jobs. I was nervous to quit my last job but I decided to take a chance with Marco, and I am so glad that I did! Everyone is super nice and always willing to help! Marco has changed my life for the better and I look forward to many more years with such a great company! When I first started at Marco, which wasn't long ago, I knew this was a great company to work for! They invest time and money not only into their customers, but their employees as well! I feel it's very important to take care of your employees because that's what makes up Marco. What m:powers me is that Marco takes training seriously, it can be a very time consuming and expensive investment, but all successful companies know that we all need training whether we have been at a company for 3 months or 30 years. Training is always a great refresher to keep our employees on track to what our mission and goals are as a team. I look forward to attending more trainings throughout my career to keep me up to speed on how to be successful. Marco has grown tremendously to almost 900 employees in my short year and a half with the company, now making it a “Big Company”. Yet it still has that small company feel where employees have a say because we all are owners. This owner mentality empowers all of us to do everything we can to ensure we have satisfied customers and to help the company continue to grow. It’s easy to get up and go to work every morning when you work for a great company like Marco. Being part of the Marco family has empowered me by doing something that I love. I love coming to work and learning something new everyday. Being a single mom, the work-life balance that Marco provides has given me the opportunity to not stress the little things that can happen in life that can affect your daily work schedule. I have never felt so proud to tell people where I work. Marco empowers me by creating and supporting a culture of success. I am surrounded by so many inspiring people who are successful and driven both in their careers at Marco and in keeping a great work-life balance outside of Marco. Working for a company with a culture as great as Marco’s constantly inspires and motivates me to do my very best not only in my career, but in all other areas of my life as well. Before starting at Marco I worked for an employer that did not appreciate me or my hard work that I put into making the place successful. I thought that is how everyone was treated and what the workforce atmosphere would be like anywhere else. Then I was introduced to Marco and my eyes were opened to a whole new aspect of what being in the workforce really should feel like. You can have faith, family and a career, all in that order. I now come to work everyday with a smile on my face, much like I did before but it's not forced this time. Marco appreciates me and all I do for the company which in turn makes me work harder everyday to become more knowledgeable at my job and more successful. So when asked what m:powers me, I will answer with Marco. Marco makes me want to do and be better. Marco empowers me to be good at my job, as well as a good wife and Mother. Being able to come to work and do your best and still be able to drive your kids to their sporting events and or other family appointments really makes Marco a wonderful place to work. Marco also empowers me to be a good community Citizen. Marco does so much for our communities that we live in, it just makes me as an employee want to give back just as much. I am now in my 25th year at Marco and the freedom and support over the years has been amazing. I have been able to do my job with success and support from many others. I would not be here if it wasn't for the help of many others on the way. I have been able to do a lot of things with my kids and coaching by having the freedom that many businesses would not have given. I thank all of the people along the way!! !